With the hectic and chaotic week of NHL training camps behind us, it's finally time to dig into the start of the condensed season. For the goaltenders, it will be a true test of sheer physical strength and mental will. With Game 1 breeding the intensity and importance of a playoff game, it won't be hard to see who stayed in shape during the lockout. You'll hear goalies across the league discuss the importance of getting into a rhythm, getting their timing back on track, and staying patient with that process. But I have to say, I'm pretty optimistic in terms of how goaltending as a whole will perform. I expected to see a few goalies suffer injuries this past week, but the only one to surface was Nikolai Khabibulin in Edmonton, and this was more about his off-season surgery than a recent or "fresh" injury. To know that 99% of the goalies in the NHL stayed healthy is a great sign, and might reveal itself with some better-than-expected performances this weekend. Of course some goalies will take longer than others to get back into the groove, and that adjustment period could mean the difference between making and missing the playoffs. So the pressure is on to hit the ground running, and that's going to make these first few games even more intense and important. By now, you've certainly heard analysts and writers discuss the importance of NHL backups this season. Their ability to step up and win key games in a condensed and grueling schedule (especially in the Western Conference) has never been so vital to a team's success, and that calls for a lot of potential shifts in value for inexperienced and promising long-term prospects. But before we drop the puck on the season, I'd like to point out the importance of a team's third-string goalie. Think back to a few seasons ago and a situation that arose with Buffalo. 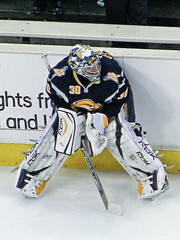 Ryan Miller was the workhorse, playing night in and night out, trying to solidify a playoff spot for the Sabres. Meanwhile, Patrick Lalime was frozen solid to the bench, rusted over from a lack of playing time. When Miller desperately needed a night off, the Sabres turned to their red-hot youngster in the AHL, Jhonas Enroth. Enroth was recalled multiple times in the second half of the season, stepped into some extremely difficult situations, and not only thrived, but excelled. It certainly helped that he was playing often in Portland and joining the Sabres with confidence, but his ability to win some key shootouts as a rookie gave the Sabres the edge they needed to rest Miller, and ultimately, make the playoffs. So consider this hypothetical: the Predators will certainly ride Pekka Rinne into the ground this season. A team that might have to fight tooth and nail for a playoff spot all season long will need him to be durable and consistent throughout the 48-game schedule. But when he plays more than 10 games in a row and begins to display signs of energy drain, will the coaching staff have enough confidence in a "cold" Chris Mason? Or might they look at bringing up a very good AHL goalie in Jeremy Smith? The same situation could arise with teams like the Flames, the Rangers, the Canadiens, and any other team that plans to ride their workhorse for most of the season. In fact, I have a feeling we'll see anywhere from 12-15 AHL goalies earn recalls, key starts, and some very big wins for their team. Braden Holtby, Robin Lehner, and Richard Bachman accomplished this feat last season, so in a condensed schedule, there's no reason to believe it won't happen again. So from my perspective, that's the "burning question" I'm asking as games get underway in a few more hours: Does it make sense to play a rusty backup in crucial games this season, or will we see more goalies being recalled from the AHL than ever before? Whatever happens, there will certainly be no shortage of excitement and drama for goalies this season. And that made my statistical projections a real brain teaser. I handled this project strictly from a goaltending perspective, meaning I didn't evaluate where I thought each team would land with their overall record, and then plug in a goalie's stats to match the records. Instead, I went the other way, which should make sense considering I focus solely on the goaltending position here at McKeen's Hockey. So I researched a goalie's stats from last season, evaluated how they have progressed or regressed in terms of their overall value heading into this season, then applied a few team concepts (defense, coaching changes, etc) and came up with what you see here. Enjoy these projections and the first day of NHL action! As you know, it's literally impossible to create a formidable statistical formula to project goaltending performances in the NHL, but it's still a lot of fun to predict what I suspect we'll see from the masked men this season!